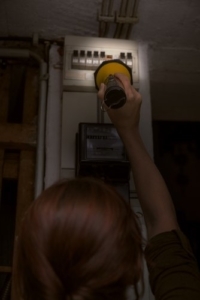 How Can I Prepare My Home for a Blackout? Blackouts can affect any power system, disrupting homes and businesses. Adequate maintenance and planning minimize the risk of a power failure, but achieving 100% reliability is not possible. Also consider that blackouts are more likely during emergencies such as extreme weather. There are many options to equip your home for blackouts, ranging from simple devices such as flashlights, to more complex systems such as solar-powered home batteries. This article provides several recommendations to make your home more resilient. A reliable light source is one of the main priorities blackouts, for the simple reason that any activity needs visibility. Also consider that moving around in the dark is more dangerous during emergencies; if you are injured, access to transportation and medical assistance may be limited. Candles and kerosene lamps are the traditional solution during blackouts, but they have one significant problem: combustion releases substances that are harmful for humans. These substances can easily accumulate indoors, especially during a blackout, when ventilation systems have no power. Carbon monoxide is especially dangerous – a concentration of just 1% causes loss of consciousness within minutes, and possibly death. With the risks of indoor combustion during a blackout, the recommendation is using electrically-powered light sources. There are three main options: flashlights, emergency lights, and lighting fixtures with battery backup. Flashlights have the advantage of being handheld, which means you can point the light beam anywhere. You can get a longer battery life with LED flashlights, and you can avoid battery purchases completely with a rechargeable crank-powered flashlight. Emergency lights have a switch that keeps them OFF when the power supply is available. These lights are equipped with batteries, and they activate immediately during a blackout. Just like with flashlights, their batteries last longer when LED bulbs are used. Many lighting fixtures have the option of adding a backup battery, which allows them to operate as emergency lights during a blackout. The same principle applies – LED fixtures can stay on for longer. Flashlights are the most affordable option, but LED lighting saves electricity all the time. If you use LED fixtures with backup batteries, they lower your power bills under normal conditions, while being a reliable lighting system during blackouts. In addition to leaving your home in the dark, a blackout disables space heating and air conditioning. This is a serious issue if the emergency occurs in a very hot or cold day, since indoor temperatures become unbearable very quickly. This effect is minimized in a well-insulated home, which comes with the added benefit of reducing your heating and cooling costs under normal conditions. To complement insulation, get your home inspected for air leaks. These also cause unwanted heat gain during summer and heat loss during winter, reducing the effectiveness of insulation. On a cold winter day, a home with many air leaks cools fast even with insulated walls. Blackouts often come with water supply interruptions, since pumping systems depend on electricity – this is especially true if you live in a building that uses a water booster pump. A simple solution is keeping enough drinking water at all times, plus a water tank for all other uses. Considering that refrigerators are also disabled during a blackout, a good recommendation is keeping a stock of durable foods that need no refrigeration. Canned products, cereals and protein bars are all good options. Avoid opening your refrigerator and freezer as much as possible during a blackout, since a lot of heat enters each time you open the door. Assuming the budget is available, generating your own electricity is also an option during blackouts. Diesel generators are the most common option, but they require frequent deliveries of diesel to stay operational for an extended period. There are two alternatives that can operate indefinitely: natural gas generators, and solar photovoltaic systems equipped with batteries. Natural gas generators are reliable because they use your gas connection instead of depending on diesel deliveries. Natural gas distribution systems are more resilient than power lines, and they are protected because most of the infrastructure is buried. As a result, the gas supply remains available during many emergencies that knock out the power grid. Solar PV systems with batteries give you an electricity supply that is replenished each day, unless the sun is blocked by cloudy weather. This option provides a power supply that does not depend on external services, as long as you limit daily consumption according to the generation and storage capacity of the installation. Having an energy generation system is the most effective way to make your home resilient against blackouts, but the initial investment can be significant. However, even if a power source is available, all other measures are still recommended to improve your home resilience. How Reliable Are Power Grids in the USA? System Average Interruption Duration Index (SAIDI), the average duration of power outages per customer. System Average Interruption Frequency Index (SAIFI), the average frequency of power outages per customer. Note that 2017 was a very challenging year for power companies in Texas, due to hurricane Harvey – the total damage had a cost of $125 billion. Summer 2019 Texas Power Supply Projections 2019: Is It a Good Time to Buy Solar Panels?